In my husband’s family there are many cooks. My MIL is one of them. My aunt-in-law is another. She lives in suburban Columbus and if you ever are lucky enough to be invited there for a meal, please clear your calendar. Over the course of four to five hours so much food will be presented to you — from frothy hand-whipped coffees and gently fried, spiced chicken to vegetarian nachos and omelets. If you’re from Senegal, there might be lamb. If you’re my husband, you love her rotli dal bhath shaak. If your child is a picky eater, there will be fresh steamed green beans prepared instantly, instead of making that poor child eat shaak. Tins of cookies are in the house somewhere. Ice cream is in the freezer. Everything is made in real time, while you are there. Please clear your calendar. I can’t even remember what Indian delicacies kaki makes because I always am overwhelmed by the multinational feasts she prepares. And usually I am so worn out by the 8-10 hour drive from Milwaukee to Columbus that I do not pay a damn bit of attention to how the food is made. Sorry. I said damn. It’ll happen again. Those football lentils in my hand transform into a low-fat, high-fiber, vitamin and protein-rich stew in just 30 minutes. Thank goodness for her daughter, beloved cousin and blogger Foodie Brooklyn Mom. She is slowly going through her mom’s mental archive of recipes and translating them into written form for those of us who lack a certain ability to read minds and memorize forty years of cooking at this point in our brain’s slow deterioration toward middle age. You may recall an earlier conversation about chutney, how I was feeling unimpressed by the cilantro-dominant blends I was putting together in my kitchen. I wanted to add mint and see what this could do for the green. My cousin had posted a recipe that features a simple 2:1 cilantro to mint ratio and a few other ingredients. I have modified it slightly, and it’s working out great. Allergic friends reading this recipe, I don’t always use the tree nuts. Like when you come over. Tonight I dashed out to the Best Foods with my daughter in crime to buy some lentils and try another of my cousin’s recipes: dal and rice. It’s a staple. In South Asia its popularity permeates borders. 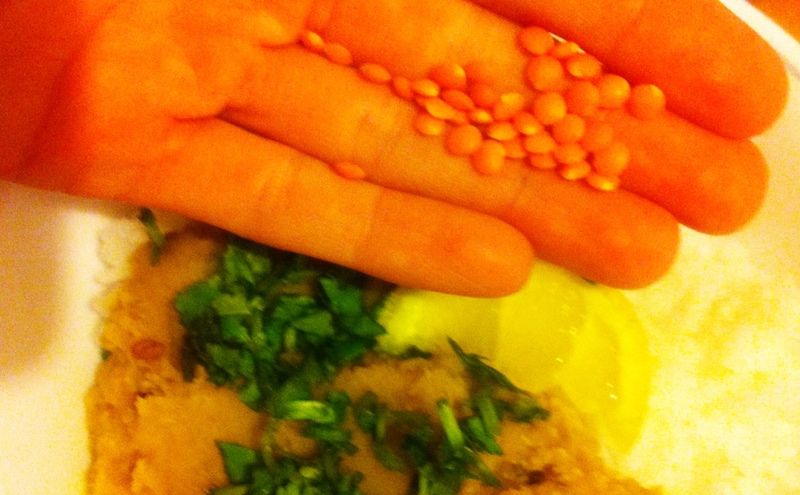 Sri Lanka, north and south India, Pakistan, Bangladesh and Nepal: everywhere they eat dal. “Dal” is the basic word for lentil, of which there are many kinds. What you eat with the lentil (vegetables, rice or roti?) is influenced by where in South Asia you’re eating. We’re Gujarati, so it’s rice and dal. I panicked for a moment in the aisle of lentils. The recipe said “red lentils,” but did that mean split or whole? After a few missteps with mustard seed, I now think that unless the recipe says “crushed,” you buy crushable ingredients in their whole form. Delightfully, this meant walking out of the store with a bag of masoor dal, discreetly parenthesized on the package as “LENTILS RED FOOTBALL.” From now on it’s Football Dal to me. Despite a lapse in planning that left me without any coriander seeds, the recipe turned out okay. Good, even, although I may bump up the spice from two chilies to three and amplify the ginger/garlic blend. But Valentine’s Dal was a bust for the rest of the family. Football dal & rice with garnish. Masoor is the lentil’s proper name. “Not all kids like Indian food,” said the Indian kid who had helped me pick out chilies just 90 minutes earlier. “I don’t like dal, but it definitely smells like Indian food in here,” said my husband. I expect little in the way of responsiveness-to-new-foods from my sons, and they delivered. They said: nothing. 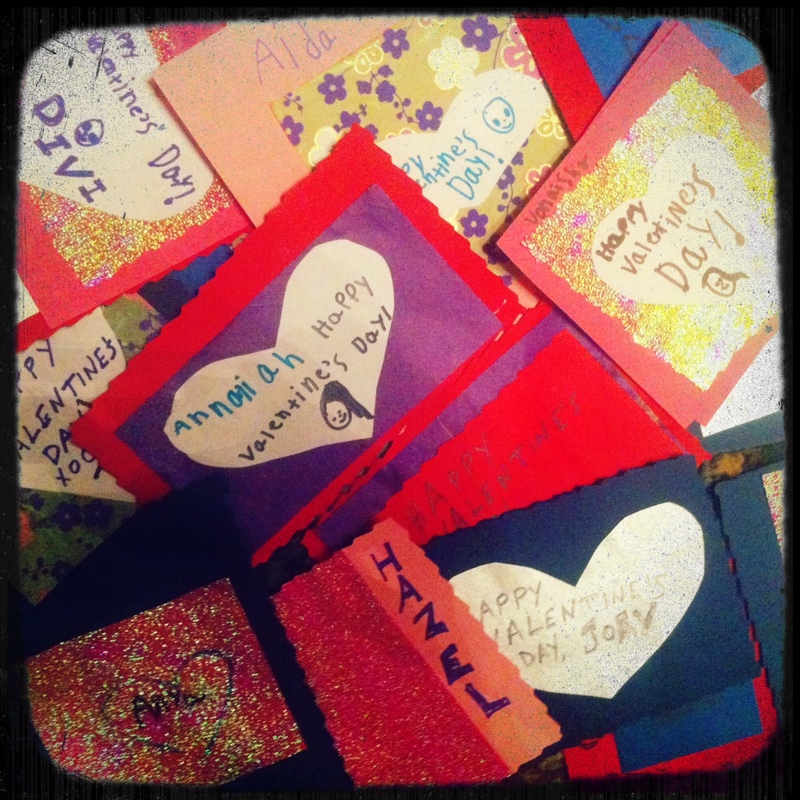 We ended the evening with some marathon Valentine making. Glue, cue tips, posterboard, fiber paper, sharpies, regular and textured scissors. It was ON. Twenty-five valentines later my daughter said: “You’re the best mom ever.” I know she meant this barely and briefly. Tomorrow I will be the ______ who won’t let her wear a striped rugby shirt on top of a striped polo shirt with Packer sweat pants. But at 8:41 p.m. I was the best mom ever. And I made Football Dal and rice. For dessert we made Valentines. Be mine? 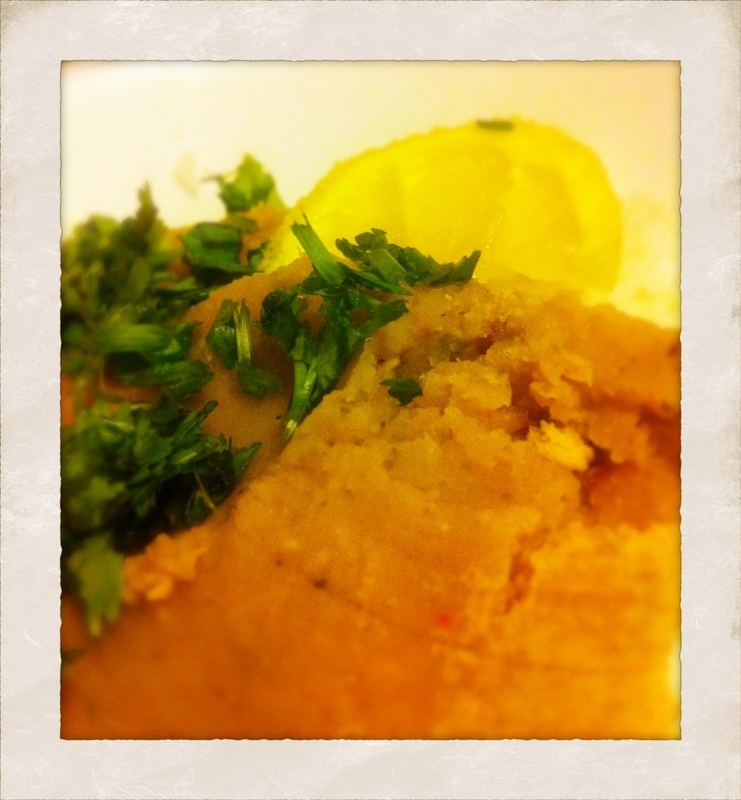 …it’s time to resume conversation about something(s) I don’t know much about: Indian cooking. A couple weeks ago we tried to make poori. A staple bread of Indian cuisine across the continent, so far as I can tell. I’ve only been to four states. It has three ingredients. My MIL can make it blindfolded standing on one foot while drinking a large bottle of white wine. That’s now the only way she makes it. “So how can this go wrong?” I ask myself as I flip open a jug minibar-sized bottle of chardonnay. Clearly & simply written, three ingredients only, elegantly photographed, I thought things might go well. And, well, they did go. In the trash. There are four ingredients, not three. 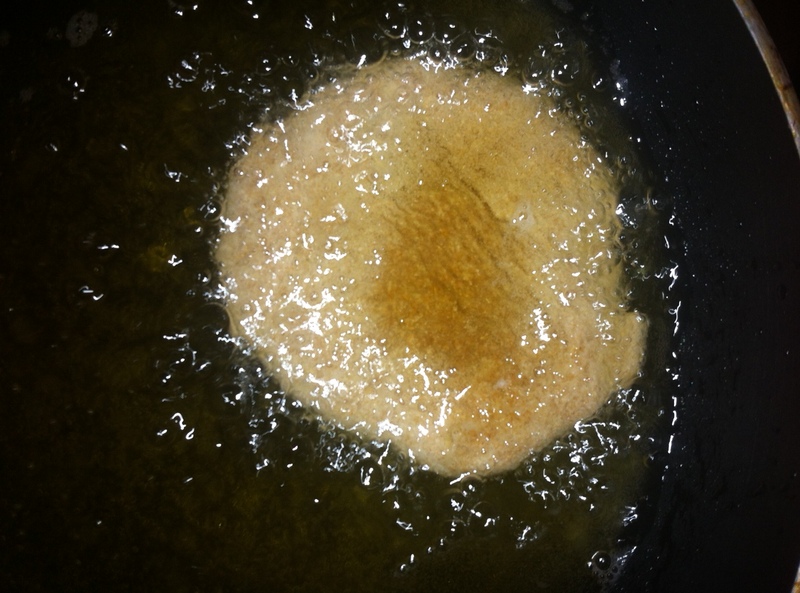 The poori must be fried in oil of a certain depth. Because no one (recipe, I’m talking to you!) told me I needed oil, I didn’t make any arrangements to have cooking oil on hand. I scrambled to assemble a pool of oil that would make this recipe come out right. I ended up with something like three tablespoons of olive oil and two tablespoons of canola oil. So, right there I pretty much knew it was over. Too many hands. I had not enough oil and too many helpers. I had an eight year old and a six year old in the kitchen. They had to help. Since I already had flubbed on the oil, there was nothing to lose in welcoming them to the bread board. Anticipation. 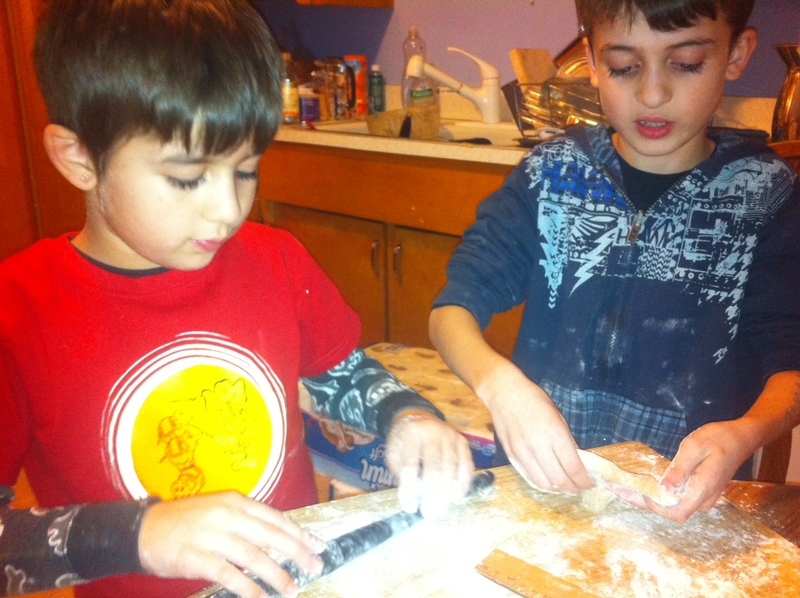 It heightened the tension in the kitchen as my kids took turns rolling the dough across the lightly floured board. Argumentation. It dissolved our trust in the process and in each other. Step Six is wide open for interpretation, demanding that we roll out the balls into “thin-medium” thickness. “Mom!” Said one pair of hands. “Thin medium is like this” – and she held up a poori pattie that had sprouted a hole in the middle. “It’s poori, not a donut!” chided the other pair of hands. This continued, but as long as they kept their hands clean and away from the hot oil, I silently endured. Impatience. I don’t know what went wrong first, or at what point things went the most wrong: oil type, depth, temperature, were the patties medium thin, not medium thick? When we placed them in the oil they just. got. oily. That’s all that happened. One poori, our fifth or sixth, puffed up on one side. 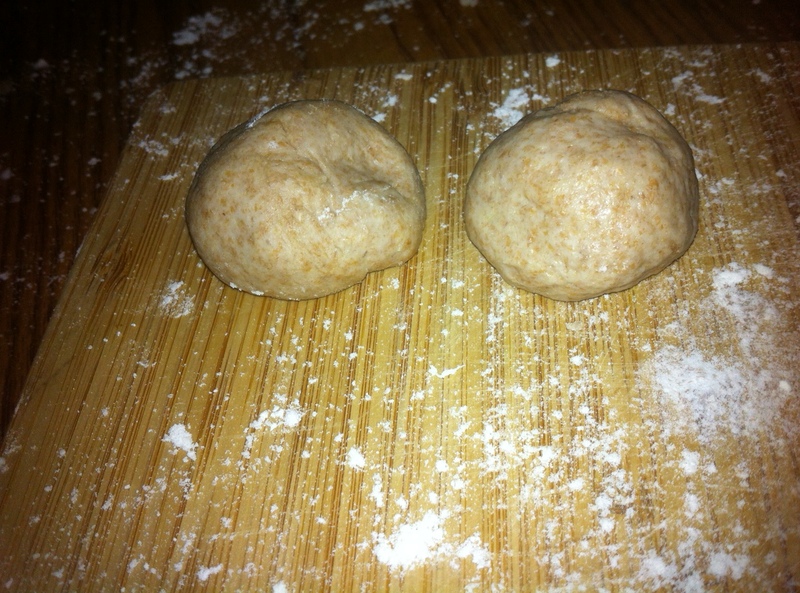 We held our breaths, waiting for the full disc of dough to rise. It did not. It was a small puff, but a big moment. I’m building on that for our next poori project. When FMLA Met National Pancake Day. Yesterday I stepped into church, Catholic Church, for the first time in about a year. I still do the holy water, the genuflection and the kneeling. I will always love the Nicene Creed. I don’t take Communion. So, walking in I do the holy water and proceed down the aisle. I get only a few steps before a man, whom I’ve never seen before, stops me. 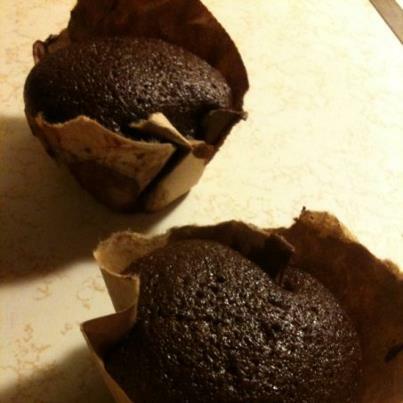 One time I made cupcakes and it was 2 a.m. before I realized I had exhausted my supply of cupcake papers. I had to laugh, because to me the paid death notices in the newspaper all follow the same, fact-based, minimally creative format. They’re expensive to run, so understandably most death-notice writers go with the bare minimum: Insert name here, date there, wrap it up with visitation and donation information. When I wrote my grandfather’s obit last week, I never thought of it as an act of writing. Anyway, I thanked the gentleman who turned out to be the undertaker. I explained that I had written something else “about cupcakes” a few weeks ago, so I wasn’t sure which piece he meant. Thirty minutes later, my aunt arrives with her husband, John. “My mother showed me the piece you wrote in the paper,” John says after a round of hugs and condolences. “The obituary,” is my succinct, all-knowing reply. “No, it was the piece about your, well, about schools.” John gets a little vague for a moment and I know why and I’m used to it. He is talking about the cupcakes. We laugh as I recount my talk with the undertaker. If anyone had mentioned my “pancakes” post during yesterday’s funeral, the confusion would have thickened like a stack of buttermilk flapjacks in the logging-camp kitchen. Been thinking about loggers lately – the result of some low-grade family research I’ve been doing to prep for my grandfather’s funeral. If you want to write a great obit: do the basics; modify an adjective like “loving” with an unexpected but accurate adjective like “brusque”; add one or two sentences of character description for warmth and flavor. For Grandpa Tom, we went with: “For years he took a daily cup of coffee at the old McDonald’s restaurant on Packard Avenue.” Poetry that ain’t, but it’s a humanizing moment and proof that “small stuff” can reveal one’s character. If you want to write a memorable essay, give it a quirky title. Trust me, I’ve written some snoozers. Folks might forget the content, might disagree with the content, dislike your tone or perspective, but they will remember you wrote something somewhere if the title sticks. And they’ll mention it! So many people have mentioned “cupcakes” to me in the last few weeks that my next piece, no matter what it’s about, will have “eclair” in the title. Or chutney! Years before I ever started to blog I taught two weeks of blog writing to college freshmen and sophomores. They could blog about anything, but they didn’t. Their collective range of self-selected topics was fairly narrow: “The O.C.” a Fox primetime soap starring that guy with the eyebrows like midnight’s caterpillars, weight loss, weight gain, the beginning/end of a relationship, high school. In retrospect, that’s a rich range. It covers a lot during a time of life when, for lots of folks, things are really starting to happen. Why was I getting cynical and condescending on all these aspiring PR execs and Rolling-Stone exposé-writer wannabes? Was it the typos? Was I not seeing the forest because all the dangling modifiers and gratuitous caps were getting in the way? Well, typos were on the grading scale. They had to be addressed. Every classroom is a rainforest when you’re teaching early-college students how to write. “Can we just deduct five points from anyone who writes about eating too much, not eating enough, or a blog about Milwaukee’s best restaurants?” I one day joked. “Or dead grandpas,” my colleague typed back in our email exchange. Reality check. Today I am a soccer-mom whose singular literary contribution is a late-night blog where I talk about food and dead grandpas. What am I doing here? And what’s your excuse? Tonight I had hunger pangs for bhel puri, but any chaat would have done. Something in-your-face fresh and colored like a rainbow and tasting like the chaos and character of Mumbai — at its best, of course — is what I wanted. This reminded me. Chutney Challenged. This is a food blog and I need to get back to it, simmering with renewed focus and adventure once life settles down just a bit. To all who followed me here seeking Milwaukee’s answer to Padma Lakshmi: do be patient. There may be no chutney right now, but I remain challenged. Very much. Always, I promise. And the chutney will come again. I promise. *That’s really not at all what my mom said, but what she said was very kind, very loving, indeed. Both my parents lost their mothers young. 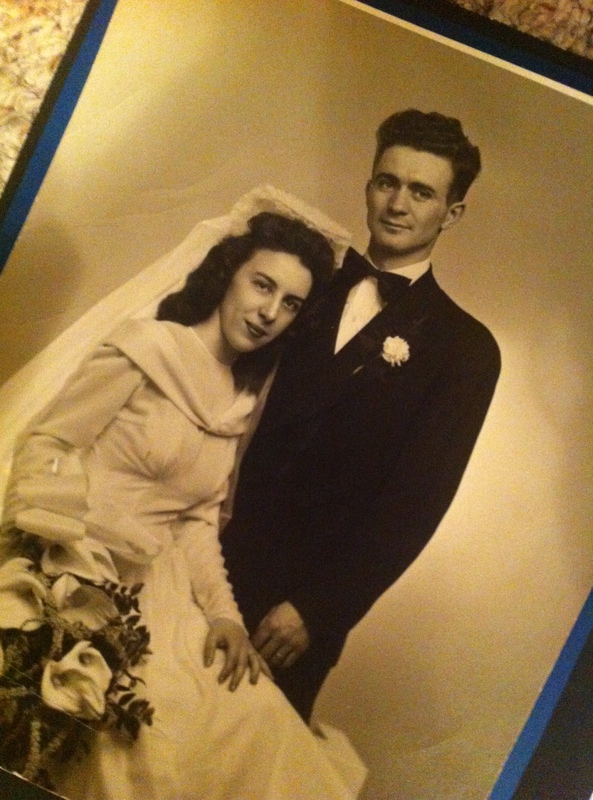 My mom’s mom passed when she was four; my dad’s mom passed when he was a 21-year-old newlywed. Both grandfathers remarried, but after 34 years it’s clear that the most grandparent I’ve ever had is my dad’s dad. Lushly coiffed at 85, prickly but funny, deeply literate but verbally brief and matter of fact, brusque but devoted, that would be Grandpa Tom. He’s only ever asked me for one thing. On Saturday. 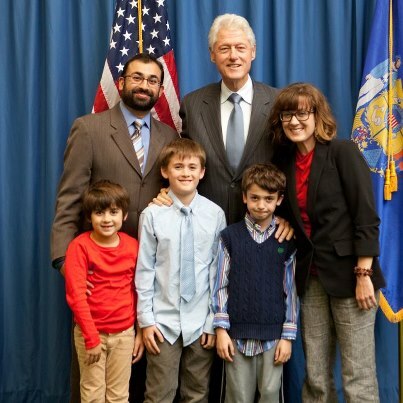 After a lifetime of his evasive and economical brand of affection, I was happy and focused in my desire to deliver the goods he had asked me for three times: a photograph of me, my husband and kids with Bill Clinton. Of course this is the picture. “Don’t forget that picture, Angie.” Really, the man can go one year without getting personal on you, so his insistence on something so sentimental really struck me. By the time he had asked, though, his hands were cramping badly and his fingers were beginning to curl together like small, ivory-tipped claws. Watching him eat a cup of orange sherbet, I wanted so many times to grab the plastic spoon from under his clenched thumb and feed him myself: deftly and fast, no drips or ice chips to navigate on my watch. I didn’t. So as I prepared to leave his ICU room in the hospital where he– widowed two years at age 51– had presented my mom with a dozen peach roses on the day I was born, I asked how he wanted the picture. His fingers couldn’t manipulate a framed photo safely, and I wasn’t sure he could see the photo if I tacked it on the wall. “How do you want the picture, grandpa?” I asked. And I do know. It’s been snowing abundantly and beautifully in Milwaukee this week and being in the ICU is messy business. The picture could have been ready the next day, Sunday. We just had to print it at Walgreen’s, right from my husband’s laptop. I would place the order just after dinner, then put the kids to bed, then go to Walgreen’s, then drive the 20 minutes to the hospital. But I didn’t. I was exhausted, the snow was falling again, the kids were rattled from a busy weekend of family, friends, iPods, indoor soccer. My dad, the second-born of my grandfather’s three sons, called. He explained how disoriented my grandfather was as he decelerated from a reasonably healthy and independent old age to full-system failure after three days in ICU. I gratefully accepted my dad’s gentle encouragement to stay home, get rest, avoid seeing my agitated, elegant grandfather restrained and sedated in his hospital bed. Monday passed as Mondays do. Kids in school, I’m at work, husband’s in D.C. I had nearly forgotten about Grandpa Tom until my mom facebooked me at 10:30 p.m. My grandfather was doing worse as his condition cascaded from stubborn pneumonia down toward his bladder and kidneys. Lucidity was random and fleeting, but he had asked about me. I called my husband. He dispatched the Bill Clinton photo file to Walgreen’s from D.C. I messaged my manager. Tomorrow, more than 24 hours after “Don’t forget, Angie,” I would deliver that picture. On Feb. 5, 2013, I rose after four hours of sleep. I turned on NPR and made breakfast as my first child groaned himself out of bed and creaked his way down the stairs. I don’t know what story was on. I heard just two sentences of it: “The single thing Bill Clinton is thanked for most, he says, is the Family Medical Leave Act. When people stop him in the airport, or on the campaign trail…” I gasped. My father continues to work full time though he’s now nearly 60. His job can be painfully physical. But he does it even now, sometimes six days per week. Since my grandfather’s sudden hospitalization last week, my dad has been using FMLA. The hospital is 15 minutes away. Before I even reach Grandpa Tom’s room, my dad and uncle tell me that my grandfather is beyond recovery at this point. We are a small family, but within minutes nearly all of us are there. Both my brothers, my dad, my eldest uncle and his wife, my mom. Most of what happens next is my family’s story, belonging to all of us. The rest of them are more private than me. By a lot. I show Grandpa Mac the picture through his barely-open blue eyes. I feel silly and showy talking about Bill Clinton, how he’s kept off his weight with a vegan diet. I explain how we saw him stumping for Obama at UW-Green Bay in October 2012. My family doesn’t really like Bill Clinton, and I’m phrasing this conservatively. But they love me and they love Grandpa Tom and he asked and, my goodness, what else should I say? It’s all he’s ever asked me for. Within minutes my brother assumes control. He’s a priest and he’s there to administer Last Rites, Extreme Unction. Just two days ago my grandfather had told my Fr. Brother to call the Archdiocese. “Those Communion wafers are so dry. It got stuck in my throat.” Fr. Brother and I both laughed at that, and at Grandpa’s suggestion that whiskey be offered to ease Christ’s body down the throats of the sick and suffering. The Rites give those moments in the room momentum and meaning. One passage is a litany of names, all of them saints, that my brother recites to Grandpa Tom: “Perpetua, Joseph, Augustine, Felicity, Mary, Francis.” I feel certain my grandfather is trying to remove his breathing mask and I start to say this, shattering the list, before I remember that these are not just words I’m interrupting. These are Last Rites. My grandfather’s stirring eases as Fr. Brother places his hands on Grandpa’s head of black and grey hair. His waving arms still. My mother says “Look,” in a hushed voice, but we don’t really need to. We sense and see his stillness, instantly. Ninety minutes later I am sitting at IHOP with my brothers and the girlfriend of the one who is not Fr. Brother. George is our server and he tells us that today, Feb. 5, 2013, is National Pancake Day. Short stacks are free for everyone. “I can’t believe Grandpa Tom died on National Pancake Day,” I say, mostly because I did not know National Pancake Day existed. Of course not, I explain. I apologize for the interruption, explain that I should not have said anything. I feel like I’ve been exposed for being briefly, awkwardly intolerant, disrespectful. I don’t think Fr. Brother sees it that way at all, however. I hope not. We talk about books and movies. Grandpa and our parents. National Pancake Day. FMLA and Last Rites are behind us for now. I know more about both after this week. I won’t forget. So I still don’t know how exactly to blog. Working on it!